Don't underestimate the importance of a reactionary gap! Don’t underestimate the importance of a reactionary gap! Don’t underestimate the importance of a reactionary gap! In the blink of an eye you could suddenly find yourself under attack! When dealing with someone who is loud, rude and obnoxious it is very important that you keep your safety in mind, and do the best you can to maintain a reactionary gap, a safe space, between you and the subject you are dealing with. In the blink of an eye the subject may start to physically assault you, and you are going to need that space to consider your options and to assess the situation as it changes. As your brain processes and recognizes an assault in progress you will need to assess whether you do have time to react and then you will need to consider your reaction options, such as do you zig to the right or zag to the left? Do you just bend at the waist or twist at the waist? Do you step back or to the side? Do you just take the hit and then roll with it into a counter strike? All this will go through your mind if you have time to go through it… And to give yourself time to go through it you need to ensure you have a reactionary gap. I found a video on Youtube that has the manager of a fast food place dealing with a young man who is loud, rude, obnoxious and highly intoxicated. The manager keeps his cool, is obviously frustrated but stays in control… but he doesn’t maintain a reactionary gap, and you see what can happen… Don’t underestimate the importance of a reactionary gap! We can’t always control the setting or location of a stressful encounter with someone, but if possible always keep that reactionary gap in mind and do what you have to do to protect yourself. The manager in this situation could have moved around the counter to maintain distance and have something between him and the subject. You do NOT have to stay in a position where someone is in your face and you feel the moisture of their breath on your face!! Don’t underestimate the importance of a reactionary gap! But you see how suddenly a situation can become a physical assault, and after the initial aggressive contact the manager did not react at all, which in moments allowed the kid to use more force. I would love to see the unedited video to see when and how the manager ultimately responded to the kid. A reactionary gap needs to be at the very least just beyond your arms reach. Ideally a gap ought to be about 6 feet wide. Your stance is critical too, you need have your feet a comfortable width apart where you have a good solid base stance. Maybe even turn your body to the side a bit, about 45 degrees, so that one possible option in an attack is to lean back and put your weight on your rear foot. The manager appears to lose his footing and balance after the second assault from the kid. Your hands should be in a relaxed position in front of you, ready to react to any aggression. The manager here has assumed a rather open, contemptuous stance with one hand on his hip and the other leaning on a counter. When the kid starts his assault the manager both times is unable to react in time due to the lack of time to react, because of the lack of a reactionary gap! Distance is time, and time gives you options! 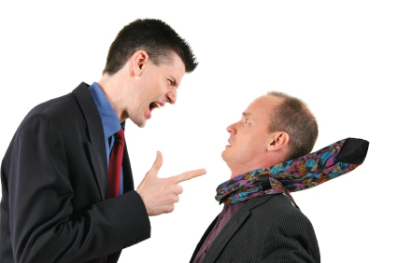 Contact me about conflict de-escalation training!